If you’re outside and become blinded by something reflecting in the distance, it might be me. I finished decorating our house for Christmas yesterday and have a feeling that I may never completely rid myself of the glitter that adorns our home. Not that I’m complaining. I like glitter. It’s so Christmas-y. 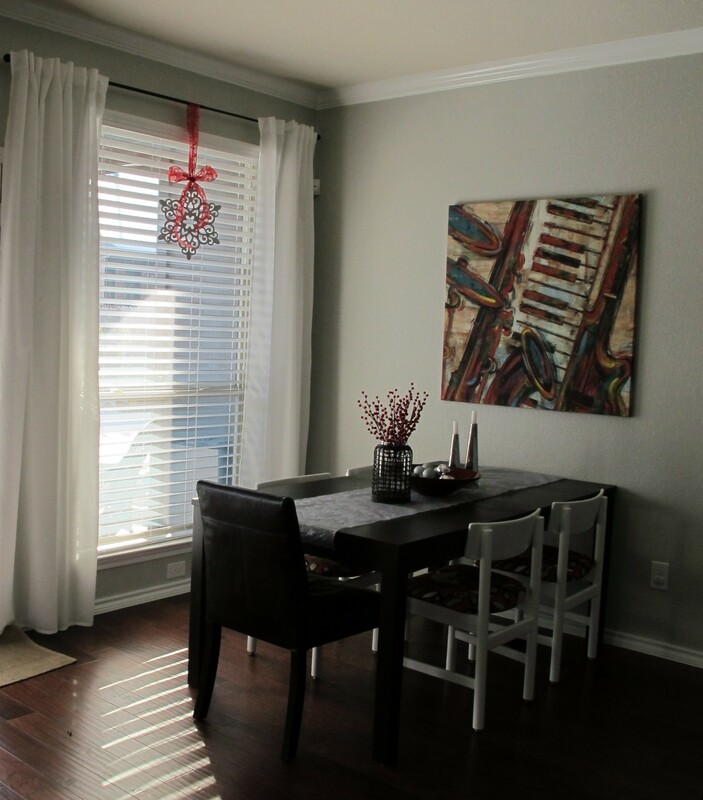 Anyways, the areas of that I decorated were our front porch (will be in another post), dining table, and windows. And I’m so excited about the result! 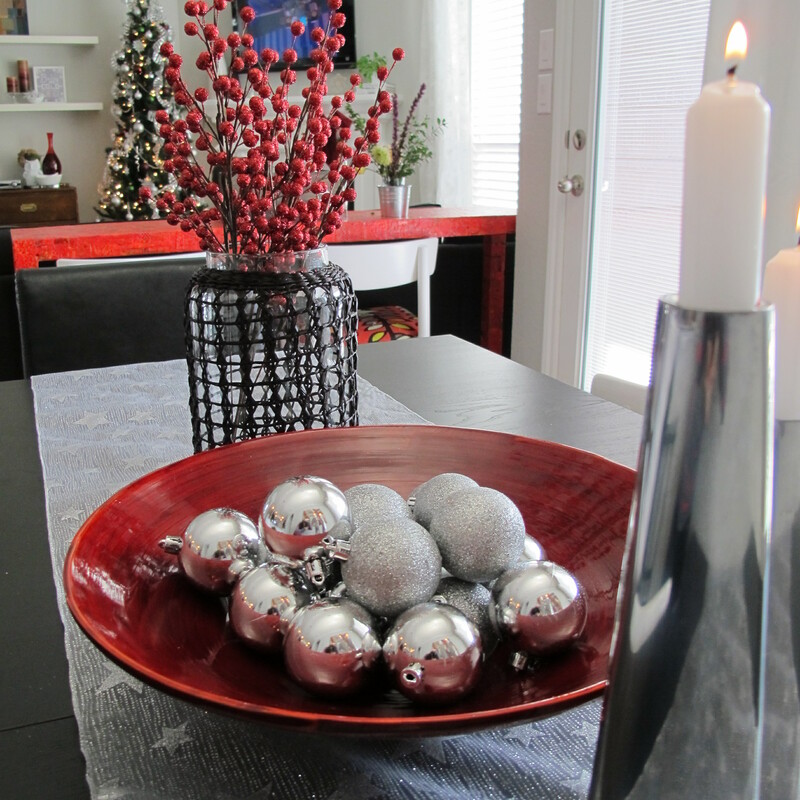 I wanted our dining table to incorporate shimmery, but elegant features. 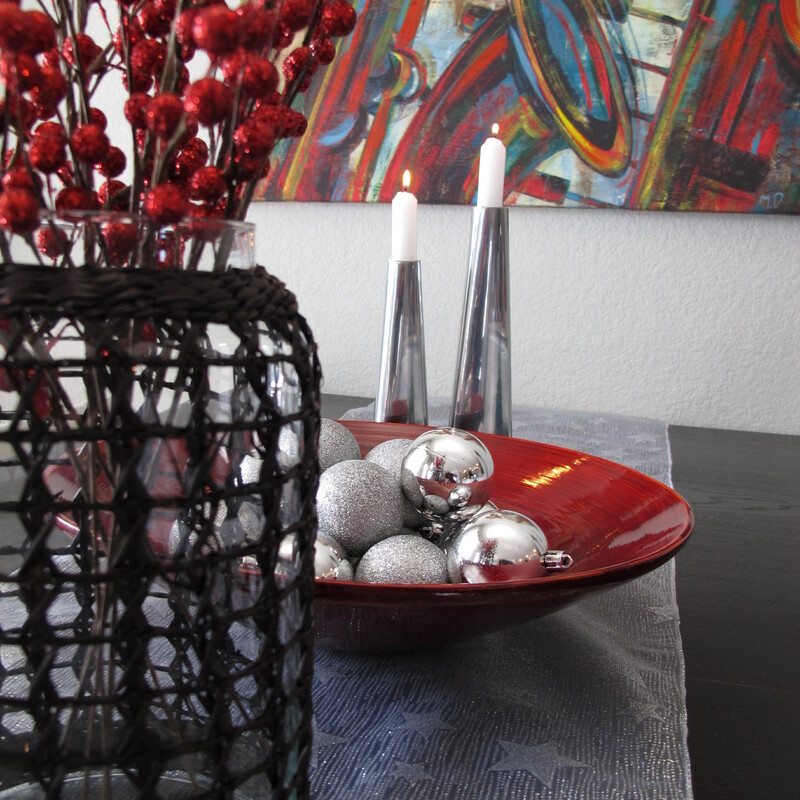 I found this wide mesh ribbon at Walmart for around 8 bucks and thought it would make a great table runner. 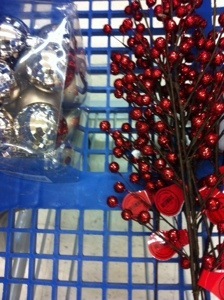 I picked up a few large snowflakes for $3 a piece and a spool of red wire ribbon for around $4. 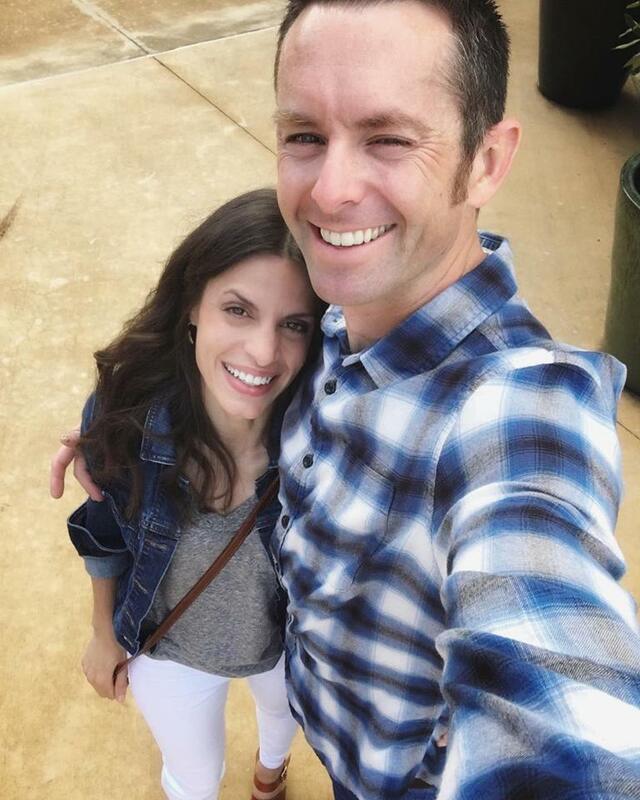 Then, I headed to Hobby Lobby (or Lobby Lobby according to Lucas). 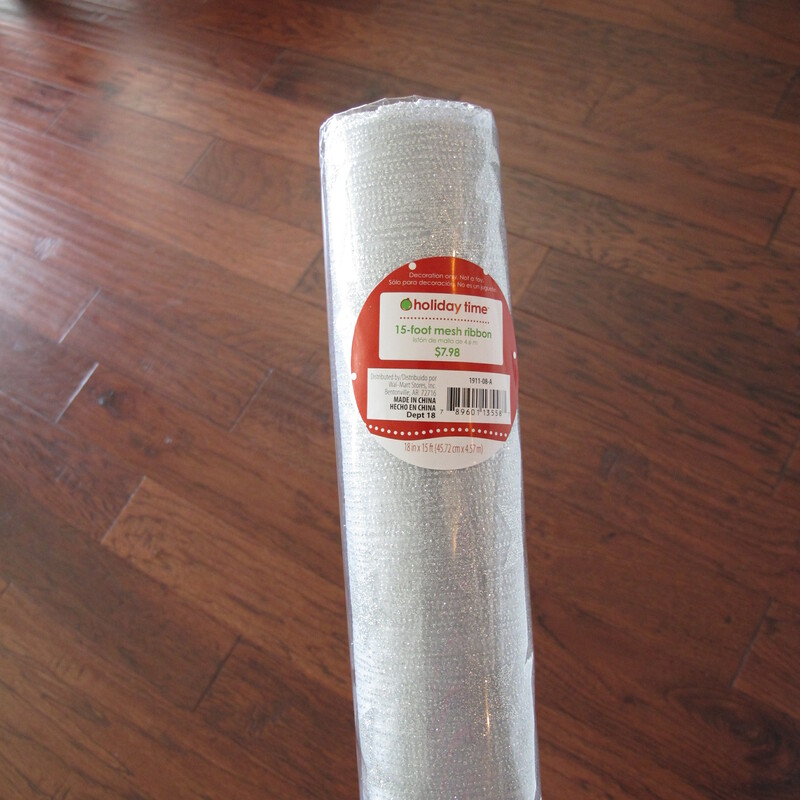 Where I considered buying this…. 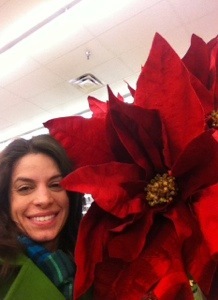 …but only because it dwarfed my head (not that that would take much… My head is tiny. Sunglasses and hats that fit are rare cats.). I totally snuck a few selfies with this power flower between idly standing and looking bored whenever another customer walked into view. I hope they don’t have surveillance cameras. Or maybe I hope they do. I’m sure those good people could use a little work-time entertainment. In the end, I passed on the flower. I did pick up these goods though…. A few berry picks and ornaments (Sorry for the tiny pics… these were taken with my cell). 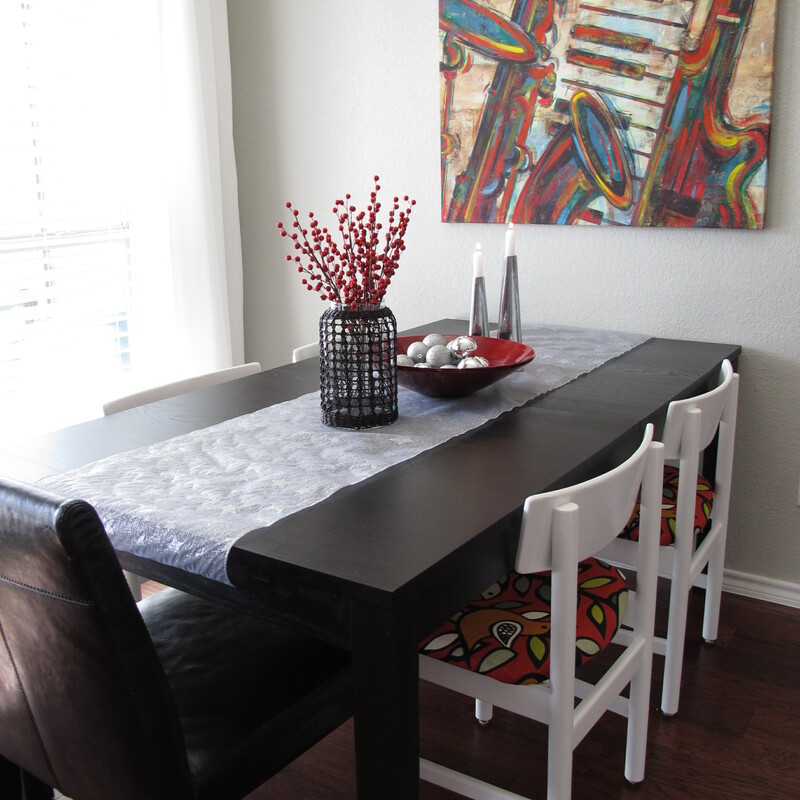 When I got home I set up our dining table…. The mesh ribbon was perfect. I simply cut it down to size and set it on there. And I have a ton left too. Bonus!! 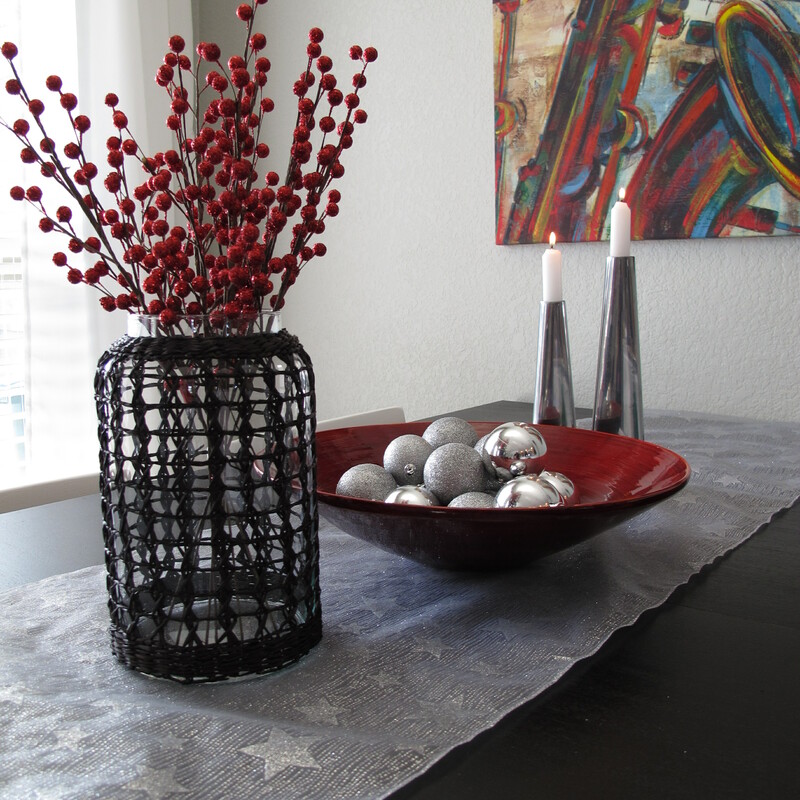 I simply added a red bamboo bowl filled with silver ornaments, a few Ikea candlesticks and the bottom of a glass/woven urn that I got on clearance from Marshalls filled with my new glittery berry picks. Next, the windows. 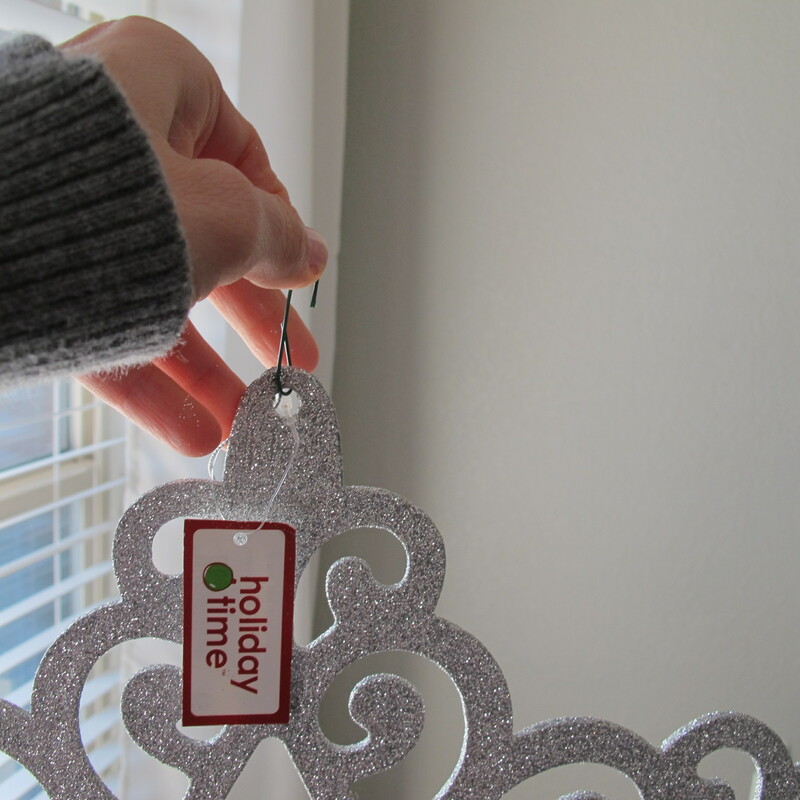 My original plan was to do something like this pin but with different ornaments and only one ornament per window. I’d planned to create them with 3D cardboard stars. When Lobby Lobby disappointed me with their lack of selection of cardboard shapes (so weird, they had a much bigger section last time I looked for them), I decided to go with the already bedazzled snowflakes that I found at Walmart. 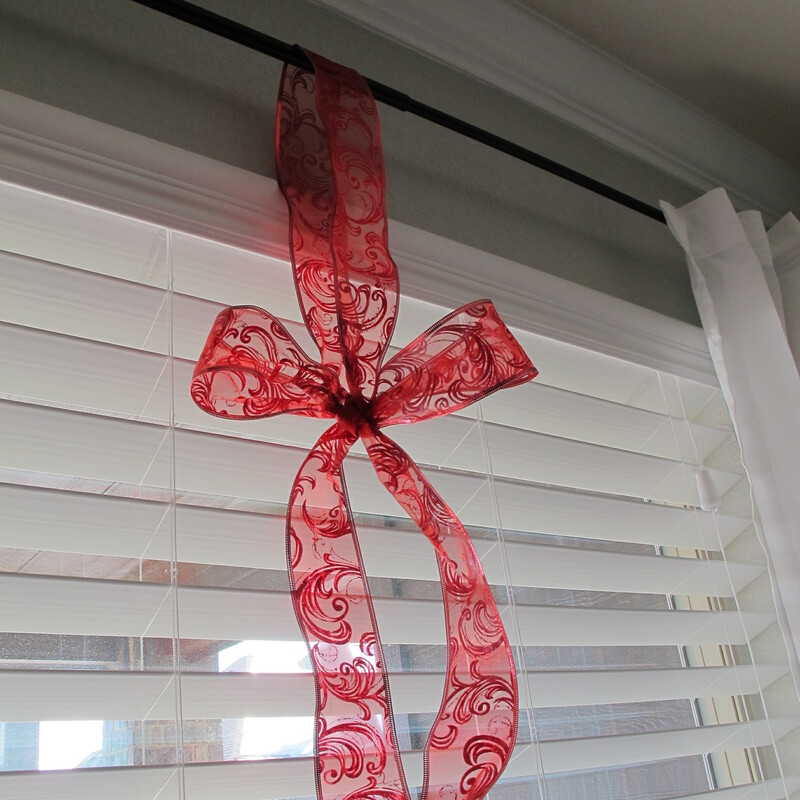 I simply cut a few long strips of red wire ribbon, looped it over our curtain rods and tied a bow. Then, I added a wire hook to the snowflake and hung it from the bow. 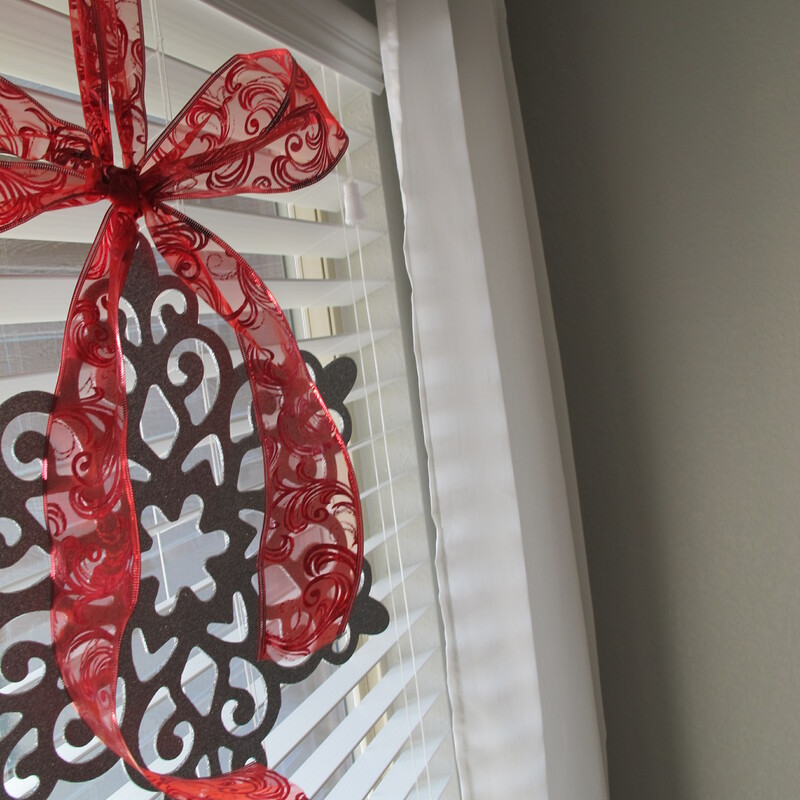 I adorned the two windows in the living room and one in the breakfast nook. Not too shabby for 13 bucks (give or take). 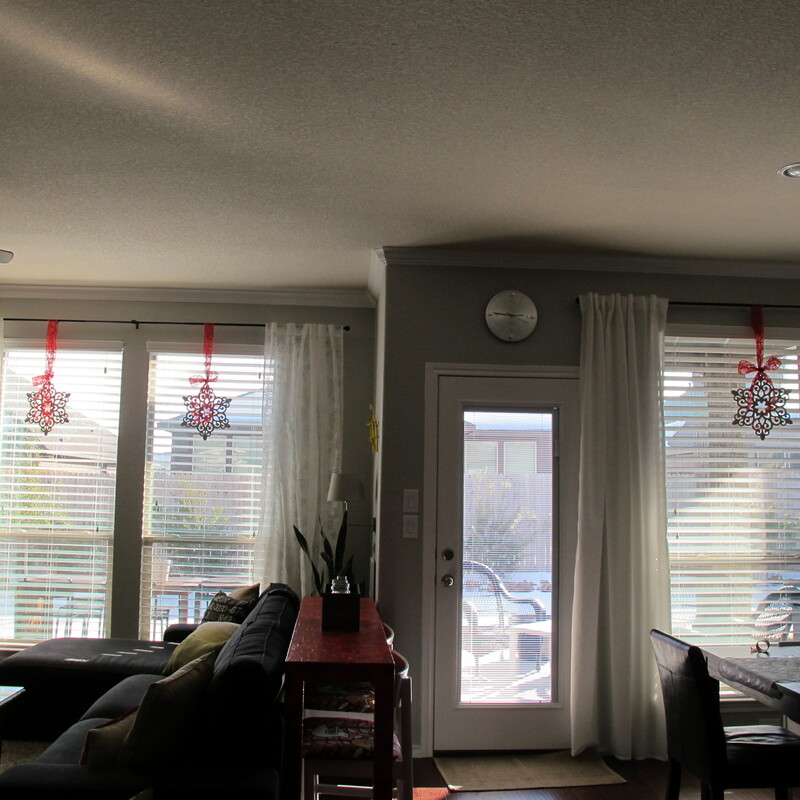 I wish I could’ve gotten a good shot of the living room with the window snowflakes, but they all came out so dark. Maybe another time. All I can say is I’m loving my little sparkly friends. The first time I stood back to look at all three hung, I automatically started singing A Winter Wonderland out loud. It just felt right. So, I went for it.